Enjoy experiencing the wild and scenic untouched beauty of the West Coast all from the comfort of a warm comfortable home perched above Whitehorse Bay. You'll soon forget the rest of the world exists... and you may not wish to leave. Waituhi (glowing waters) is located at the very start of the famous Coast Road - this stunning drive is an attraction on its own, however also in the area are numerous other attractions like the Pororari River Walk, The Truman Track, Punakaiki Blowholes (15 mins drive), cave rafting and glow worm caves at Underworld Adventures in Charleston or the historic bridge and caves at Fox River. 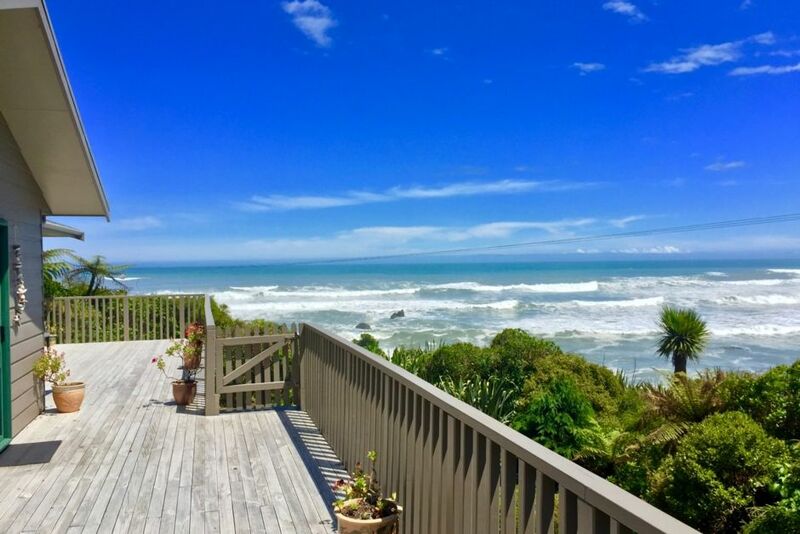 Or you may just want to sit on the deck and watch the waves rolling in. Located down a private access road, Waituhi shares this bay with just one other home. Rainforests grow from the mountains of Paparoa National Park all the way to the beach on your doorstep. Native birds are abundant in the forest surrounding the house and on the beach. Little Blue Penguins reside nearby. Sandflies are plentiful on the West Coast, however, screens are fitted to the windows for your comfort. No broadcast TV but Netflix is provided. Smoking allowed outside only - please use ashtrays provided. Water is drawn from a local waterfall and is not treated - you may wish to bring bottled water... I always drink straight from the tap. Nearest shops and petrol are 30 mins north in Westport. I fell in love with the West Coast - and it's a pleasure to able to share my patch of paradise with you. If you want a true 'Wild West Coast' experience in a dramatic private beach setting, surrounded by rainforest and nature... then this is the spot for you. Wrapped in nature ~ This is 'end of the earth' escapism at its best! Free phone for local and 0800 calls. Two electric heaters are provided in the living area as well as a fan heater in the bathroom. Quality bed linens provided with lots of pillows and extra blankets. Please note that the wifi can be temperamental - usually during peak usage times, this property may not be suitable if you need continuous high-speed wifi. Plunger available - BYO plunger coffee. Instant coffee is provided. Waituhi has lovely gardens leading to short forest walks - great for the kids to explore! Incredible! What an amazing setting for a holiday. A private stretch of beach completely to ourselves! The house was very comfortable and had everything we needed. We couldn't have asked for a better place to stay! Thanks so much! It was clean, tidy and welcoming! The beds were comfortable and the deck views were stunning. The beach isn’t good for swimming but private and great for enjoying the scenery. The kitchen was well stocked- only flaw would be to have some sharper kitchen knives. We would be back for sure. Waituhi is such a fantastic house! We couldn’t believe the drive in and how close it is to the water. We had a relaxing week and beautiful weather. We would definitely stay there again! Stop Looking ! Book this place. Everything about this location and bach was amazing. Private bay, stunning stunning view, and scenery. This is a decent sized Lockwood home, with great facilities and a nice garden. Internet speed was not a problem either, we found the sandflies minimal at this location also. We all agreed that this was the best holiday home we had ever stayed in. Daniel - the owner was great to deal with and very prompt with replying to messages. We would highly recommend this property, you will struggle to find better. Great spot to have a holiday. Comfortable beds, fantastic view and some nice touches to welcome us.